This Roundtable date is April 3, 2019 at 15:15 - 16:30 local time. Join the Mobility Field Day Exclusive at Aruba Atmosphere 2019 as they discuss the new OpenConfig project focused around wireless and Wi-FI and how it has the potential to disrupt the proprietary management and monitoring structures of traditional networks. 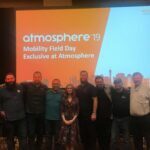 Join the Mobility Field Day Exclusive at Aruba Atmosphere 2019 as they talk about the movement of control and data into the cloud. Also discussed are the privacy impacts of cloud and how operational and regulatory needs may be at odds over time.